Portsmouth Sailing Club : Sailing 2019 Update! Home / News / Sailing 2019 Update! Documentation for this year's Spring Race series for the Parhelion trophies will be published shortly. Dates shown in the calendar area of this website. Racing will follow a similar pattern to previous years although we hope, if conditions suit, to get out into Hayling Bay for some of the racing in order to provide a little more variety. There are no increases to entry fees, however, in order to encourage a few more competitors, a 50% discount will be offered to competitors who recruit a new entry and also to the new entrant! Inter-Club Events. We have been invited to join Portchester and Hardway Sailing Club members in their 'Inter-Club' Series. This comprises a five race series from June through to August, dates again in the calendar. Further details to be published but please note the dates as it would be great to see a good turnout from Parhelion/Portsmouth SC boats. 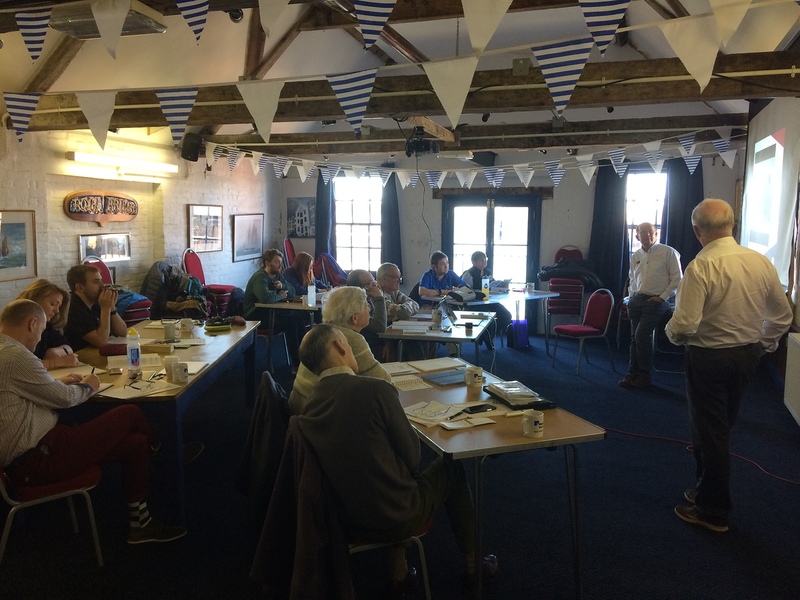 And finally, as you can see from the picture, Portsmouth SC hosted an RYA Race Officer course over the first weekend of Feb., so we have a few new race management team members itching to get out and set some interesting courses!